I had these done on time but I forgot to post the pictures yesterday. 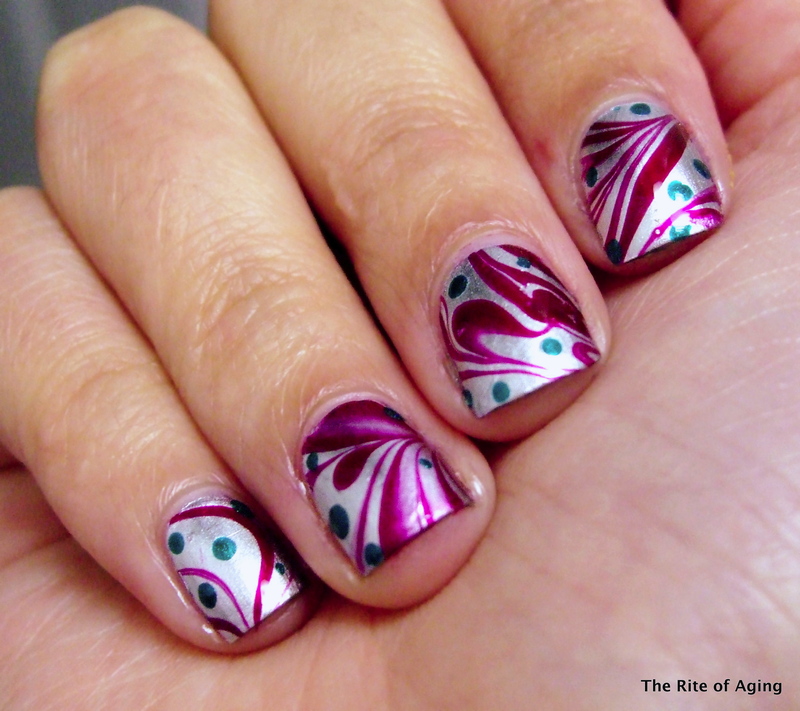 What better way to do red and green than with a water marble? Unfortunately, the green and red did not want to marble together so I just did the one color and dotted the second. I started with 2 coats of Essie No Place Like Chrome as my base. I marbled with Sephora by OPI Mr. Right Now and dotted with Zoya Giovanna. Check out the other red & green manicures below! love the way you added green dots to the swirls! Thank you!! I’m really happy with how the marble came out…I’ve always had pretty good luck with Sephora by OPIs! Thank you Mandy! Mr. Right Now is one of my favorite “crelly” polishes! Super pretty and sparkly! I think the dots give it some lovely depth and complexity! Thank you Sumeet! I considered just leaving the manicure at the marble but it didn’t look quite right without the dots! I LOVE THIS! Amazingly done! Thank you!! Sephora by OPIs marble really nicely! The new Formula Xs are a little too thick. …I miss SOPI!